Executive Order description by Kosoko Jackson and Sara Tabatabaie, of Rock the Vote. This early on, one thing is clear: The president is going ham on executive orders. And we need to pay attention. Basically, it’s an official statement from the president advising federal agencies on what to do and how to use resources. Executive orders do not create laws, but they give specific instruction on how to operate under existing laws. Trump’s executive order on building a border wall basically establishes building the wall as a federal priority and directs the Department of Homeland Security to use already-available funding to get the ball rolling on its construction. He’s not creating any law to build a wall. He’s directing (well, ordering) the Department of Homeland Security on how to spend its existing budget and to prioritize construction. What gives presidents this power? There’s actually nothing in the Constitution that specifically gives a detailed outline of executive orders, but there is a “grant of executive power” in Article II, which has been cited to give presidents this authority. 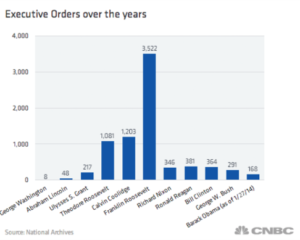 Every president to date has used executive orders, and more than 13,000 have been issued since 1789. They’ve been used in all different instances: to respond to natural disasters, states of emergency, war, economic crises, to promote civil rights… and sometimes to limit them. What can we do if we support or oppose a particular order? The most effective thing is to vote for candidates who are aligned with your values. The president has the power to issue executive orders, and only the courts can strike them down. Members of the Senate confirm Supreme Court nominees, so we must vote carefully in presidential and midterm elections in order to impact how executive orders come to be. We also need to tell our Senators how we expect them to vote when Supreme Court candidates are being confirmed. Whether it’s by making calls to the Capitol, to district offices, emailing or even showing up in person, we must hold our elected officials accountable. Lastly, we can join rallies in support or opposition to executive orders, write blog posts, or tell the stories of people who are affected by executive orders. Speaking truth to power is an important part of what it means to be American. Froze all hiring by the executive branch, excluding military and national security related positions. Ordered fast track environmental reviews and approvals for infrastructure projects that Governors or heads of federal agency agency deem high priority. Ordered review & revision of Clean Water Rule, which Obama administration had used to extend Clean Water Act protections to streams and wetlands. Required executive agency appointees to sign pledge to never lobby a foreign government and to refrain from lobbying for five years after leaving government. Loosens Obama-era restrictions that required former lobbyists to wait two years before being hired, changing the requirement to one year. Ordered review of financial regulations in order to reduce regulations that were put in place by Dodd-Frank, the Obama-era consumer protection law that was meant to reduce risk and reform Wall Street. Directed Labor Secretary to delay and review “Fiduciary Rule,” which required investment advisors to disclose potential conflicts of interest. Reinstated a GW Bush administration policy known as the “Mexico City Policy” or “Global Gag Rule,” withholding US Agency for International Development support from organizations that discuss abortion. Reversed the Obama administration’s halt on construction of the Dakota Access and Keystone XL oil pipelines. Restructured National Security Council, elevating chief political strategist Steve Bannon and downgrading role of chairman of the Joint Chiefs of Staff and the Director of National Intelligence. Required that if new federal regulation disseminated, two regulations need to identified to repeal.